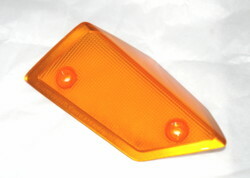 Right Front Turn Signal Lens - Brand new OEM Suzuki right side (when sitting on bike) turn signal lens. Price does not include shipping. 50 state shipping for this item is $2.75. When ordered with other items the shipping will be based on the weight of the total order.